Free Printable Valentine Treat Bag Toppers are fun and modern designs with gold foil that will impress your adult loved ones and children! 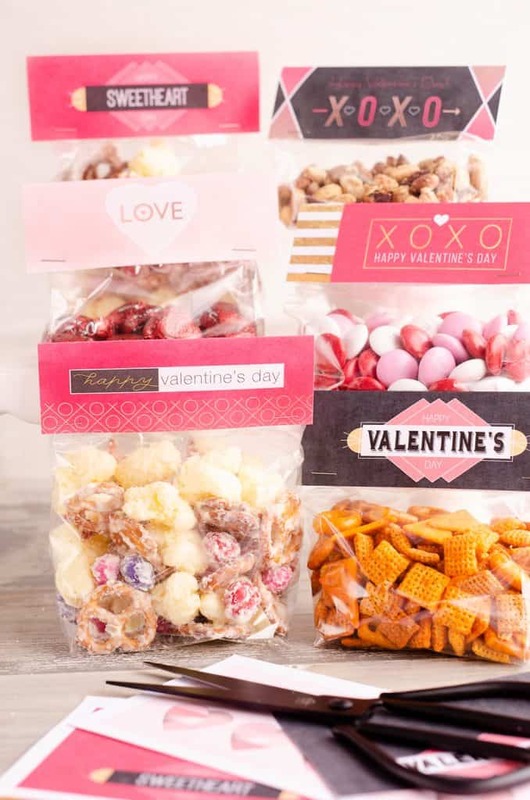 Print out these easy DIY templates for a special gift idea filled with your favorite sweet treat or snack mix. 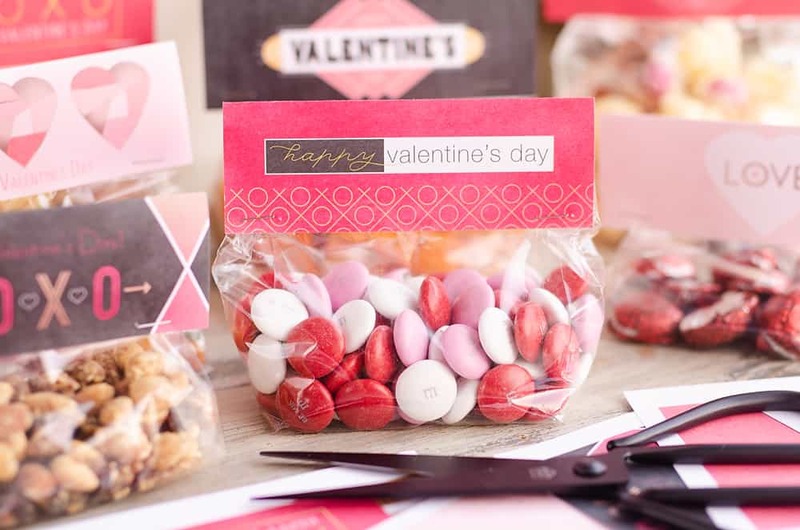 If you are looking to make something a little more special than store bought cards this Valentine’s Day, make your own gifts with these easy and FREE Printable Valentine Treat Bag Toppers! The design templates are modern with gold accents which are perfect for adults and kids alike. Whether you want to treat your coworkers and friends to a special treat or you are looking to make something unique for your children to pass out in the classroom, these are just what you have been looking for. Fill them with your favorite homemade snack mix recipe or buy some seasonal candy for an easy gift. Either way, they are sure to be a hit and impress your loved ones! 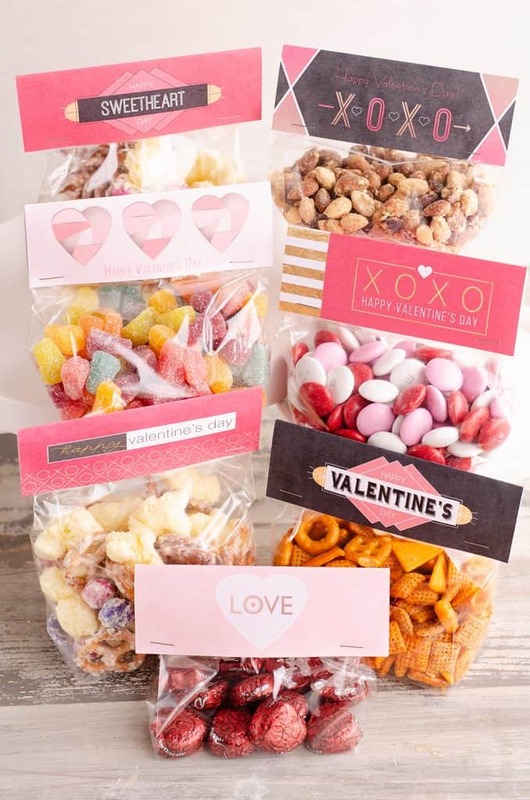 These Free Printable Valentine Treat Bag Toppers come in a fun variety of seven different design templates. From soft and sweet to bold and modern, you can mix and match the designs or pick one and treat everyone with the same gift. While homemade Valentine’s gifts might take a little extra time and effort, I have made these free printables easy and stress-free to print, cut and staple on your treat bags. Spend an extra 10 minutes to show your loved ones just how special they are! First things first, you will need to choose which of the seven printable treat bag topper designs you want to use below. Once you have chosen your designs, click on the image below to download the free printable PDF. Once your designs are downloaded to your computer, you should print however many you need on cardstock or heavy white paper. If you only have plain printer paper, it will work but won’t be quite as sturdy when you assemble the treat bag toppers. There are four treat bag toppers to each page. I always recommend going into the ‘Additional Settings’ tab when printing designs like this and setting your print quality to ‘high’. When I printed these at normal quality on my basic computer the colors were dull and there were streaks in the design. 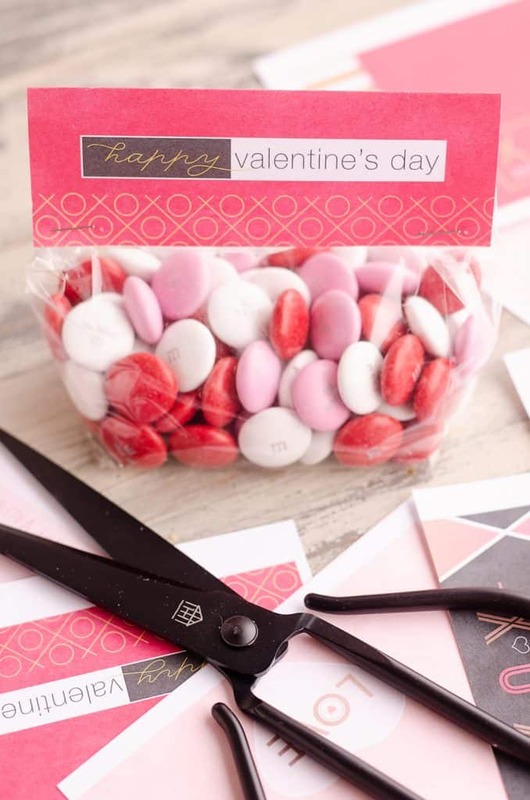 Using a scissors or paper trimmer, cut out all of the Valentine Treat Bag Toppers. 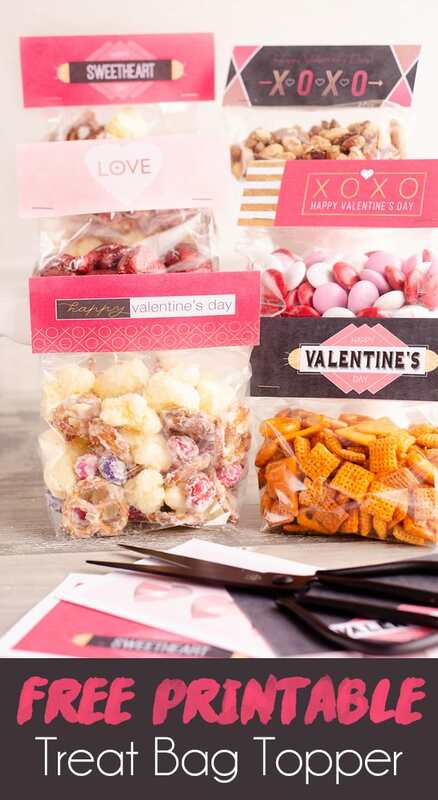 Once all of your toppers are trimmed up, you can begin filling your treat bags with your favorite snack mix, Valentine candy or granola or trail mix for healthier treats. Whether you make it homemade from scratch or buy something at the store, these treat bags will still be a cute personalized gift. Roll the tops of the filled bags over a couple times and staple them closed in the center with one center. Fold the toppers in half and sit one on top of each bag. Using your stapler, carefully staple the treat bag topper on the bottom corners of each design, securing the topper to the bag. 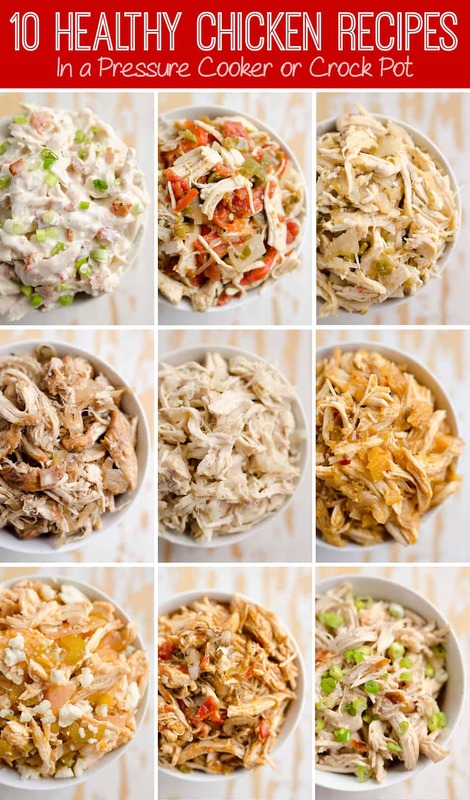 Once they are all stapled together, you can share them with your friends, family and loved ones for a unique Valentine’s Day gift they are sure to appreciate! Click on the template below that you wish to download. It will take you to a PDF template with four printables on each page. 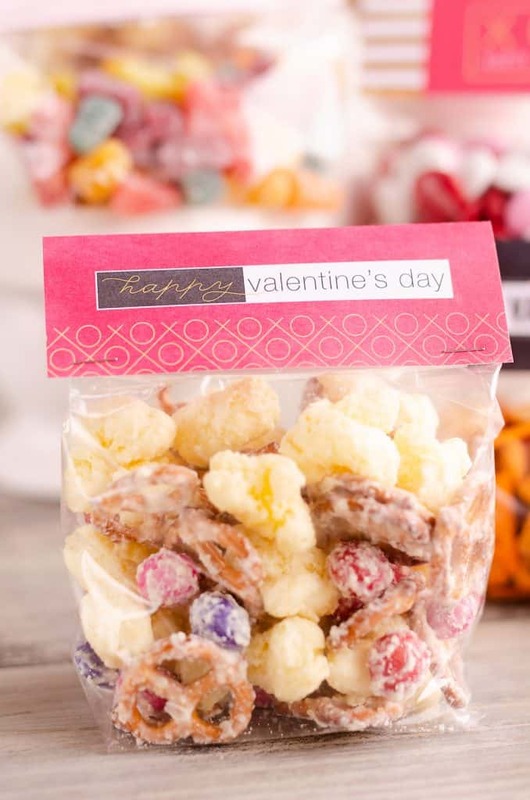 If you wish to use a variety of treat bag toppers this Valentine’s Day, scroll to the last image. This will download two pages with all seven designs seen here in addition to a free bonus design! 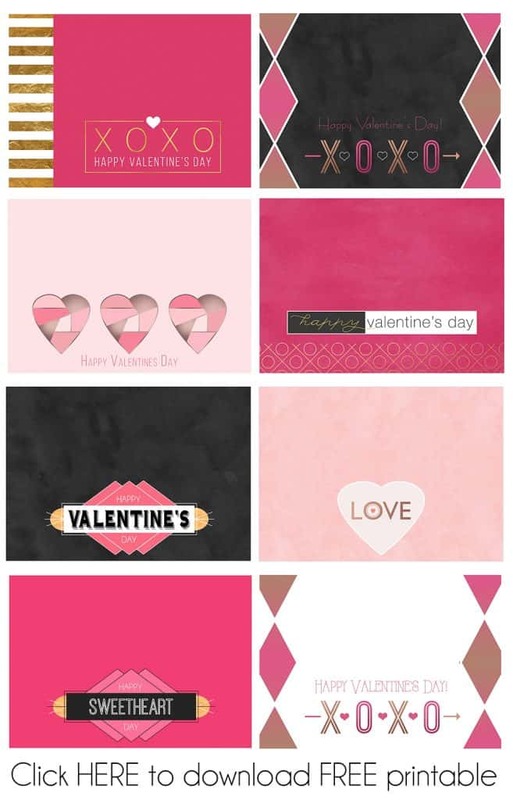 For the full set, click the image below to download the variety pack of Free Printable Valentine Treat Bag Toppers! Can’t wait to grab some treats and make these cute bags with the girls this year! I have to show my daughter these! 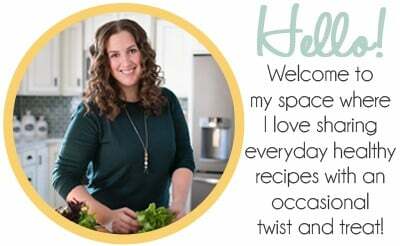 Her little girls will think this is so much fun to do make! They are so cute! Such an amazing idea! Are you a graphic designer? These are so dang cute! These are gorgeous! Thank you so much for sharing so freely! They were a hit at our “care package crew” (moms who bring multiples of things to send to our girls in college). Ahh that is so sweet that you guys send stuff to your girls in college! Happy you were able to use these printable for such a great project. These are so cute and perfect for Valentine’s Day! !